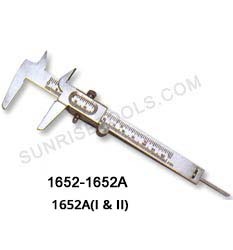 Description :-This Pocket Degree Gauge is lightweight, sensitive and smaller than conventional gauge is used for accurate measurements of stones and other small objects up to 10mm. 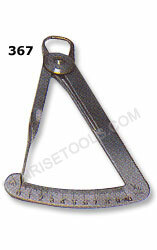 Made of stainless steel with easy to read indices. Description :-This gauge is used to estimate the weight of most popular shapes of diamonds without removing the stone from the mounting. Also includes a conversion book. Made of stainless steel and durable. 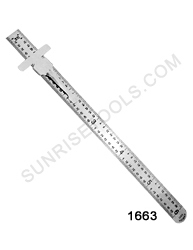 Description :-This Well made very good quality and Lightweight gauge is made of polished steel with easy-to-read brass indexes. 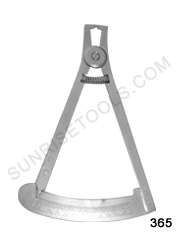 Great for accurate measurements of gemstones and other small objects. Made of stainless steel and durable. 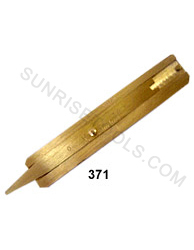 Description :-This Depth Gauge is made of brass and surface is finely ground. Well engineered to measure depths. Compact and durable. 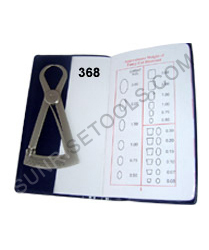 Description :-Made of hardened stainless steel and commonly used to measure internal and external distances extremely accurately. Easy to read LCD digits, rolling thumb wheel. Long lasting & corrosion free. 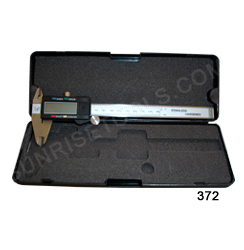 372 Digital vernier Caliper 6"
Description :- In use, the body is aligned against the one edge of the object and the blade is presented to the end or body of the object. If the end is being checked, then a strong light source behind the square will show any mismatch between the blade of the square and the end of the object. 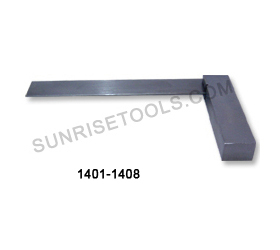 The purpose of this action is to either check for squareness or to mark out the body of the workpiece. 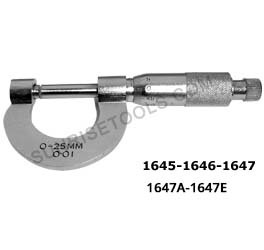 Description :-Micrometer screw gauge is used for measuring extremely small dimensions. Can even measure dimensions smaller than those measured by a vernier Caliper. Strong rugged metal construction. Measuring screw handle, Satin finish with friction knurling for easy rotation. With locking mechanism to hold measurements. Description :- Made of hardened stainless steel, it is an ideal tool for a broad range of industrial and automotive applications. 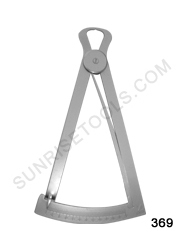 Quickly and effectively measures the internal diameter and thickness of an object. Durable and long lasting.